Ok here I go, my very first blog. My wife has been behind me for weeks now to get the recipe published on this blog. I hope you enjoy the hot parathas as much as I enjoyed writing this blog. Cut chicken into small pieces. With the help of a meat-mincer, mince the chicken. You can also use a dry grinder. To the minced chicken, squeeze in half lemon and a little salt, mix well and keep it aside for half an hour. In a flat pan, take some oil. Once the oil is hot, add chopped onion. At this time, you may want to sprinkle a dash of salt to the onion, to expedite the cooking process. Sauté till slightly brown. Add chopped garlic, ginger and sauté for a minute on low flame. Add chopped tomato, mix well and cook on medium flame till the tomato mixture turns to a nice pulp and starts leaving oil. Now add the chopped green chilly. Ok its now time to add dry masala (corriander powder, garam masala, chilly powder, cumin powder, pepper powder), mix well for a minute on low flame. Add minced chicken, and mix well on high flame for a minute, reduce the flame, add salt to taste, cover the pan and cook around 10 mins. Open and cook till all the water has been absorbed. 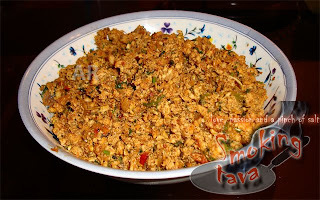 Don't get frightened, if you see your cooked minced chicken turn into big chunks of mass. Use two flat wooden spoon, pound it on the chicken in quick succession. Pound it till it changes into the consistency as shown in the picture below. Switch the flame off. We are almost done, add chopped coriander and squeeze in a lemon, mix well and allow the mixture to cool. Make balls out of the dough and then roll it into small circle around 8cms diameter, leaving the centre portion thicker than the edges. Now place 2 tbsps of keema in it (or, as much as you can), bring together the cover from all the sides to the center, seal tightly and roll the parathas. 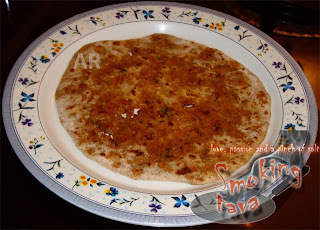 You may use wheat flour to dust and keep the paratha from sticking. Cook on a hot tava, use a little oil, and cook until both sides are golden brown. I suggest having the hot and delicious parathas as it is, but if you like you can have them with some mango/tomato pickle. Added a few extras of my own and tried your recipe.. Its an absolute winner.. My husband and i loved it.. Thank you..